As the new King’s Cross station concourse opens (officially) today, my final blog post looking at a less well known passenger service offered by the original railway company – the conveyance of the dead away from London. 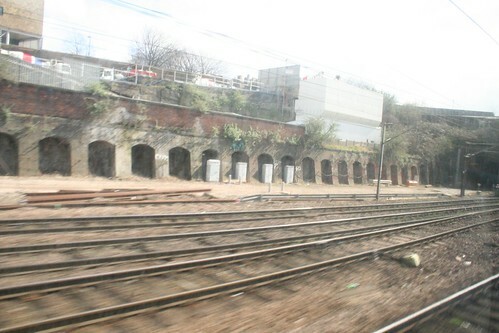 Although the necropolis railway at Waterloo Station running out to Surrey is quite well known, its northern counterpart is seemingly largely forgotten – although not surprising as there is almost nothing left of the railway component to point out to local visitors/tourists. As the Waterloo railway transferred the dead all the way out to Woking, the cost for the service was out of the reach of the average poor, so to offer a cheaper alternative, the Great Northern London Cemetery Company was set up in 1855. It cut costs in part by putting its cemetery much closer to London so that the rail fare could be more affordable. In fact it was so close to London, that today it is inside London, at what is now New Southgate. 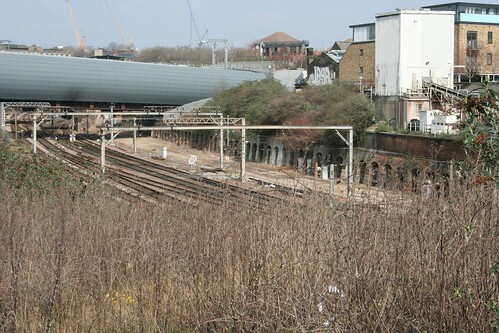 The departure point at King Cross was to the north of the modern station, on what is today a little noticed side road. The building itself has long since vanished, with the rail-side land still vacant, and the road area looking like is now occupied by a cement factory (modern map link). One of the several innovations that the Great Northern Cemetery Station offered was a fully functioning morgue and mourning rooms. At the time, it was normal for the dead to be left at home for a few days during mourning, which was hardly very sanitary. With the new station, the dead could be taken to a dedicated and more sanitary area for the mourners, and then would be lowered by a hydraulic lift to the railway level. 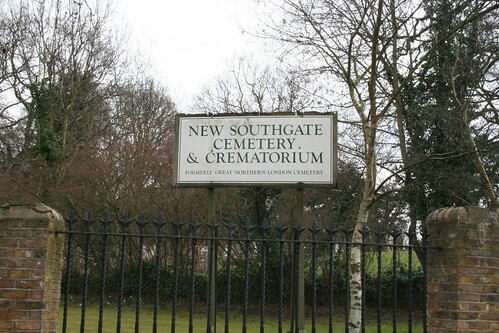 Twice a week, a train would collect the mourners, and the dead to convey them on their final trip, up to New Southgate. Here a dedicated station was also built, called simply “Cemetery Station” right next to the cemetery where it was convenient to carry the coffins on horse drawn carts the short distance for burial. Although the service opened in 1861, it seems to have closed by 1873 so despite appealing to the large poor masses, it never gained their favour. At some point both stations were demolished. Up at New Southgate – nothing whatsoever remains of the site to indicate its former heritage. The land between the railway and the cemetery was sold to a vast telecommunications factory – Standard Telephones and Cables – but is now an office park. The site of the station itself is now occupied by Barnet Borough Council. 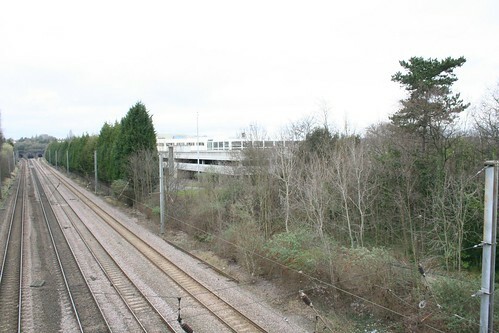 I guestimate that the car park is where the Cemetery Station once stood and there is nothing whatsoever left of the railway siding that once stood there. However a tiny bit closer to the road bridge were I stood, you could make out that the railway space is wider, so offering a lingering hint that something once stood there. A couple of hundred yards down the road is the final destination for the passengers. Wow!, To think that for 4 years (in the early 80s) I worked for STC at New Southgate (now the North London Business Park), and I never knew anything about the history of the site. As a native forty something Londoner I’m loving your blog and have had to link to it from mine as it’s very complimentary. This is an amazing article and I have learned a huge amount — I shall be catching up on your past content and keeping my eyes peeled for more in eager anticipation. The Mortuary Chapel in Kings Cross had a distinctive wedge-shaped spire and was demolished in the 1960s to make way for the concrete plant. Only indistinct pictures of it exist. The distinctive, intimidating red-brick wall around the site is original to the mortuary and often used for photo shoots. Fascinating story. I photograph historic sites as hobby and explore historic architecture. Where can I find out more about the two railway limes for the dead? Someone mentioned a book. Can I have the details please? This is an area I researched some years ago and my findings were published by Barnet Museum in my book: ‘The End of the Line’, which is still available through the museum or direct from myself. I grew up in the area and as a child many of my neighbours worked for STC. I even used to go to the summer fairs they held. I had never heard of this service until watching a dvd from a railway magazine mentioned it. This sparked my interest and ‘surfing’ brought me to this site. I also worked for many years around the Kings Cross area and also my mother is buried in that cemetary. My g.g.g. Grandad was a station inspector at Kings Cross when first opened and later at Bourne station in Lincolnshire. When he died there, he was transported down by train to the Kings Cross cemetery station and then onward to New Southgate station to be buried in the cemetery so have always been very interested in any information regarding the stations. I really found this article most informative. Cheryl – I have just come across your post. I am a Genealogy Officer for the Great Northern Railway Society. We are building a database of GNR employees and I would like to add your GGG Grandad to it. What was his full name and do you know whe. Or where he was born, or married to? Thanks. I have been sent a picture of GNR No. 1 with the Cemetery station at Belle Isle in the background, dated around 1937-8. I was stunned to read the vivid account of the STC bombing, as my late mother was one of the registered nurses employed there at the time. She arrived for her shift just after the bomb had fallen, and helped with the aftermath. She would never give us details, but did give an interview to a Royal College of Nursing archivist many years later.